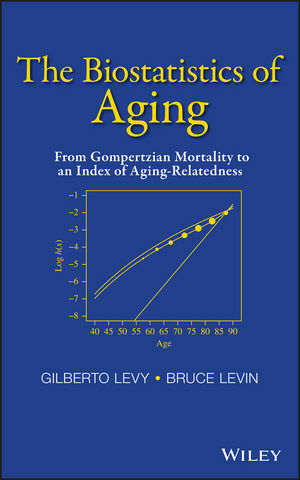 Providing a thorough and extensive theoretical framework, The Biostatistics of Aging: From Gompertzian Mortality to an Index of Aging-Relatedness addresses the surprisingly subtlenotion—with consequential biomedical and public health relevance—of what it means for acondition to be related to aging. In this pursuit, the book presents a new quantitative methodto examine the relative contributions of genetic and environmental factors to mortality anddisease incidence in a population. The Biostatistics of Aging: From Gompertzian Mortality to an Index of Aging-Relatedness is an excellent resource for practitioners and researchers with an interest in aging and aging-related diseases from the fields of medicine, biology, gerontology, biostatistics, epidemiology, demography, and public health. GILBERTO LEVY, MD, DRPH, is a neurologist with a primary research interest in aging and aging-related diseases, particularly dementia. He conducted clinical research within the spheres of epidemiological studies and clinical trials at Columbia University for more than ten years. Dr. Levy is the author of over thirty journal articles and three book chapters. BRUCE LEVIN, PHD, is Professor of Biostatistics and past chair of the Department of Biostatistics in the Mailman School of Public Health at Columbia University. A Fellow of the American Statistical Association, his research interests include sequential selection procedures and their use in adaptive clinical trial designs. He is the coauthor (with J.L. Fleiss and M.C. Paik) of Statistical Methods for Rates and Proportions, Third Edition, published by Wiley.